Image source: United States National Archives. Colorized courtesy of Algorithmia. The final defensive stand of the Japanese Imperial Army in World War II in Batangas was at the mountain range called Mt. Malepunyo due east of Lipa. 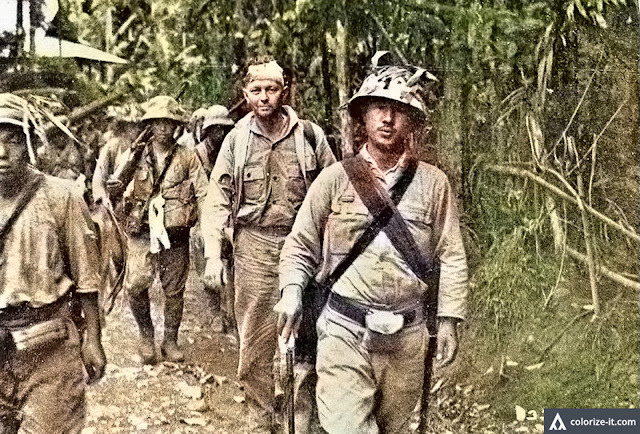 The Japanese fought bravely as could only have been expected, but at this time the United States Army could devote all the resources available at its disposal in Southern Luzon to the reduction of the Japanese resistance. Led by the 511th Parachute Infantry Regiment, backed by massive firepower both on the ground and from the air, the Americans finally captured the mountain range on the last day of April 1945. For all intents and purposes, Batangas could by this time be considered completely liberated from Japanese occupation; and all that was left for the American Army to do was to mop up and flush out to capture or kill Japanese stragglers who has somehow managed to escape. The following day, the 1st of May, the 187th Glider Infantry Regiment, which had been the lead group in the capture of Mt. Maculot, captured a diary presumably from one such straggler. The regiment had been redeployed to Tiaong from Maculot precisely to block the escape of Japanese soldiers from Malepunyo. The soldier whose diary was captured was part of a group making its way to Mt. Banahaw via Tiaong. Excerpts from this diary, which are taken from Major Edward M. Flanagan Jr.’s 1948 book1, are presented below. Much of the documentation on Batangas History about World War II has been about Japanese abuse on the civilian population in Batangas2. These excerpts give refreshing insights about the Japanese with the shoe decidedly on the other foot. Staring capture and possibly death in the face, the soldier was narrating what it felt like to be taking a dose of his own medicine, albeit for the most part still defiant. 14 April 45. My suffering surpasses even that of death. I finally arrived at Mt. Malepunyo. I have just one ball of rice to eat. The enemy air and artillery bombardment is fierce. 15 April 45. The enemy has concentrated great numbers of troops in Tanauan, San Pablo, and Lipa, and is approaching our front — the enemy artillery bombardment is terrific. We, who are ready to die, are preparing for the enemy attack. My great crisis is approaching. This morning the enemy approached to within 100 meters in front of us. Their rifle and artillery fire is increasing. Day after day the enemy drop propaganda leaflets which request us to surrender. To hell with them; I’ll never surrender even if I must die. No food and no water, only grass and wood. The suffering is great, and there is no communication with Headquarters. Perhaps death is finally upon me. 16 April 45. I'm hungry! I want to eat rice, fish, and vegetables. I want to eat everything. My bowels are growling. If I go down the mountain, I will be able to drink sweet coconut juice, but there are many troops. Why don’t friendly troops come quickly from Manila? There are no friendly planes. Day after day, there are only enemy airplanes. I want to take a bath. Today again I survived. I wonder when they will attack again. The friends, who promised to die together, have died, but I am still wandering around the fighting zone. At present only seven men under Sergeant Okamura are left from the squad. 17 April 45. I’m still alive! This morning another hopeless day has come. I finally started to eat grass. Enemy aerial bombardment is fierce. Corporal Sugihie and two others went to Headquarters for a message. I pray that they got through safely and will accomplish their mission. My hope is that friendly troops will come from Manila and help us. Mt. Malepunyo is cold in the morning and night. Every night I'm thinking of home. 18 April 45. Hunger woke me! About 1500 hours the enemy approached our rear. The crisis is great now. Artillery shells drop like drops of rain. The end has come, I'm going to die bravely, I pray for the country's everlasting good fortune. I’m completely surrounded. I am going to attempt to cross the enemy lines under cover of darkness. I anticipate going towards Manila. Passing through mountains and ravines I penetrated the enemy front lines. 19 April 45. Manila is still far away. Today I was assigned as a supply man. 20 April 45. The enemy is all around. 3 men killed and 3 wounded. The annihilation of the unit is imminent. 21 April 45. Danger is approaching this ravine. Last night an enemy patrol entered the ravine, but we repulsed them. Enemy bombardment comes closer and closer. 24 April 45. Another day and no food. At 0800 I started to penetrate the enemy lines with seven other men as a raiding unit. By 1830 I accomplished my mission. 25 April 45. I’m still alive, the danger is increasing. I heard that Headquarters is fighting fiercely, despite being surrounded by the enemy. The enemy seems to have stopped our supplies. Today three men came under my command. 26 April 45. The enemy is fierce, but the morale of my men is high. Three messages from Headquarters came through the enemy lines. 27 April 45. Preparation to move was completed by 0400, and at 0800 we departed towards Mt. Banahao via Tiaong. I wonder if we can get through safely — the enemy line is dangerous. 29 April 45. Arrived east of Mt. Malepunyo. I sent out a patrol. Arrived near Tiaong and hid in the ravine. 30 April 45. Day has come, and because of the enemy we cannot talk. No food. I hope the enemy will not find us. 1 “The Angels: A History of the 11th Airborne Division 1943-1946,” by Major Edward M. Flanagan Jr., published 1948 in Washington.